HONG KONG—Hong Kong chief executive Leung Chun-ying got a long-sought-after meeting with Chinese Communist Party head Xi Jinping at the APEC meeting in Bali. According to veteran political observers, Xi Jinping most likely did not say things Leung wanted to hear during their meeting together. On Oct. 6, Xi Jinping met with Leung Chun-ying, popularly known in Hong Kong as C. Y. Leung, for forty minutes. Afterwards, the two met with the media for one minute, during which Xi made a few remarks about Hong Kong. What Xi Jinping had to say about Hong Kong has been reported differently by mainland Chinese media and overseas media. When C. Y. Leung met with the media later, he said Xi Jinping had made it clear that all issues related to political reform must comply with the Basic Law and the decisions of the Standing Committee of the National People’s Congress. The whole society must act according to the law, Xi is reported to have said. C.Y. Leung said that he and Xi Jinping did not talk in detail about political reform or about the time table for it. When the regime-mouthpiece Xinhua News reported on the meeting, there was no mention of political reform. Xinhua emphasized Xi Jinping’s hope that the Hong Kong SAR government will continue to rule according to the law, further develop the economy, and improve people’s livelihood. The Washington, D.C.-based China expert Shi Cangshan said the usual practice would be for the Xinhua account to be approved by Xi Jinping’s office. “They certainly think that the issue of political reform is too sensitive, fearing that it would split the party, give rise to different opinions and hence finally decided to delete it,” Shi said. C.Y. 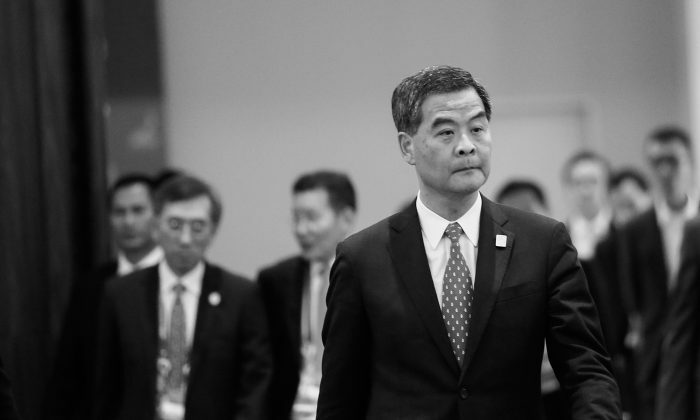 Leung also claimed that he spent time talking with Xi Jinping about the economy, including the tough measures Leung has taken on property, about Hong Kong’s role and contribution to the nation’s next stage of development, and about Leung’s hope to have support from Party central. Xi Jinping is said to have had no specific response to these topics. “It has been said that Beijing is discontent with Leung’s change of direction in the past year,” Shi said. Shi also said that, unlike other officials, Xi Jinping did not use jargon like “unity” or “stability” or claim he was in “agreement with the chief executive’s work” or vent criticism of the pan-democrats. “Apparently, Leung did not get what he wanted from Xi Jinping,” Shi Cangshan said. “C.Y. Leung must have been scolded in private,” Cheng said. Legislative Council Member Leung Kwok-hung thought Xi Jinping was obviously discontent with Leung’s performance, pointing out that nothing was said supporting Leung. Since CY Leung took office, Xi Jinping has repeatedly refused to see him, including Xi’s last visit to Shenzhen, just across the border from Hong Kong, on Dec 7, 2012. C.Y. Leung “coincidentally” went at that time to the neighboring city of Guangzhou, but the two did not meet. This April the two met at Bo’ao in Hainan Province, but they did not talk. The only previous time they met and spoke was when Leung made his routine report to Beijing in December 2012. Xi Jinping did not speak then, he just introduced the team that is in charge of Hong Kong and Macau. Based on past practice in the CCP, Xi Jinping’s giving those introductions had significance. His doing so was an indication he has taken over control of policy for Hong Kong and Macau, which had formerly been in the hands of the faction of former CCP head Jiang Zemin. Xi’s action was a hint to Leung that he should not follow the wrong team. Epoch Times has previously reported how C.Y. Leung was brought up in the Party and eased into the chief executive position by Zeng Qinghong, who is a stalwart of Jiang Zemin’s faction. Since gaining power, Leung has carried out Zeng Qinghong’s directions, which are aimed at making the political situation as difficult as possible for Xi Jinping. Translated by Y.K. Lu. Written in English by Stephen Gregory. Factional infighting explains the recent show of support given Hong Kong’s embattled chief executive at a recent meeting with Hong Kong’s security chiefs in Beijing.